George Washington’s words in this letter represent a stirring plea for help at the darkest moment of the American Revolution. As few other documents do, this letter illustrates Valley Forge as an icon of American perseverance and resolve in the face of cruel fortune and overwhelming odds. 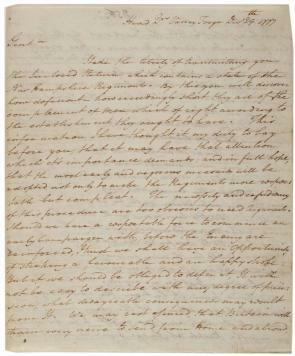 This circular letter, sent to all the states except Georgia, depicts Washington at his most impressive. In this version of the letter, which was sent to New Hampshire on December 29, 1777, Washington makes clear his urgency, gives a shocking but compassionate description of the plight of his troops, and issues his stern but considered warnings of the consequences of failure. After ten days encamped at Valley Forge, Washington transmitted returns to the New Hampshire legislature. Noting "how deficient, – how exceedingly short they are of the complement of men, which . . . they ought to have," the commander in chief proceeded to detail the urgent need for additional troops and supplies. Washington importuned the New Hampshire legislature to take "early and vigorous measures" to raise more men. The outcome of the war, he stressed, depended on it. The suffering of the soldiers at Valley Forge, and Washington’s desperate attempts to rally Congress and the states to their aid, has become legend. This was the first large, prolonged winter encampment that the Continental Army endured—nine thousand men were quartered at Valley Forge for a six-month period. During that time, some two thousand American soldiers died from cold, hunger, and disease. The troops who survived emerged seasoned and disciplined, a far cry from the untrained men who had straggled into camp during the bitter December of 1777. I take the liberty of transmitting you the Inclosed Return, which contains a state of the New Hampshire Regiments. By this you will discover how deficient, – how exceedingly short they are of the complement of men, which of right according to the establishment they ought to have. This information, I have thought it my duty to lay before you, that it may have that attention which it’s importance demands; and in full hope, that the most early and vigorous measures will be adopted, not only to make the Regiments more respectable but compleat. The necessity and expediency of this procedure are too obvious to need Arguments. Should we have a respectable force to commence an early Campaign with, before the Enemy are reinforced, I trust we shall have an Opportunity of striking a favourable and an happy stroke; But if we should be obliged to defer it, It will not be easy to describe with any degree of precision, what disagreable consequences may result from It. We may rest assured, that Britain will strain every nerve to send from Home and abroad, as early as possible, All the Troops it shall be in her power to raise or procure. Her views and schemes for subjugating these States, and bringing them under her despotic rule will be unceasing and unremitted. . . . There is one thing more to which I would take the liberty of solliciting your most serious and constant attention; to wit, the cloathing of your Troops, and the procuring of every possible supply in your power from time to time for that end. If the several States exert themselves in future in this instance, and I trust they will, I hope that the Supplies they will be able to furnish in aid of those, which Congress may immediately import themselves, will be equal and competent to every demand. If they do not, I fear—I am satisfied the Troops will never be in a situation to answer the public expectation and perform the duties required of them. No pains, no efforts on the part of the States can be too great for this purpose. It is not easy to give you a just and accurate idea of the sufferings of the Army at large—of the loss of men on this account. Were they to be minutely detailed, your feelings would be wounded, and the relation would probably be not received without a degree of doubt & discredit. We had in Camp, on the 23rd Inst by a Field Return then taken, not less than 2898 men unfit for duty, by reason of their being barefoot and otherwise naked. Besides this number, sufficiently distressing of itself, there are many Others detained in Hospitals and crowded in Farmers Houses for the same causes. . . .
Read the document introduction and transcript in order to answer these questions. Select a portion of Washington’s letter to illustrate his mood in December 1777 as he and his army encamped at Valley Forge. According to Washington, of the difficulties the Continental Army faced, which posed the most significant danger? Why? George Washington’s ability as a commander has frequently been questioned. How do his leadership qualities become evident in this communication? What does Washington describe as the most crucial needs? Provide an explanation as to why the Continental Army was so poorly provisioned.